"My spirit is the life force or a kind of intelligence that is the base of my existence. In mortality, my heart and mind seems predominant in shaping my character. Deep inside me, I know there is an independent, vibrant and everlasting spirit that existed before I was born. It connects with a spiritual source that touches my heart and influence my mind to help me perceive my purpose of living on this earth. It charges me with an energy that has allowed me to perform miracles. It perhaps is the spiritual quotient(SQ) of Man which science has yet to uncover. It has given me a greater vision and understanding than what my mortal heart and mind can conceive. The spirit is a different dimension from what we know in mortality and science has yet to prove its existence. Being spiritual is quite different from being religious though through organized religions, many come to learn of spiritual things. Like a compass that always points to the true north, I believe the spirit has the same effect on me. This blog post is rather special in that it will be a live post. I have just started my fast and will share many things as my body weakens and maybe my mind too but my spirit I know will get stronger. During this time, I will endeavor to share my spiritual thoughts. It will also be part of my letter to our oldest son Han serving on his mission in Manchester UK. "I felt that if this was true, the knowledge gained from this visitation would be even more important that of Man going to the Moon." So today, in the year 2012, 33 years from that time when I first learnt about the restored gospel, I now write and affirm that the knowledge received by Joseph Smith and shared to the world as revelations from God, has truly been the most valuable knowledge I have ever received and can be for all who hear it that are not afraid to follow it's precepts. Now that I've matured over the years and can reflect on all the things I've done right or wrong in my life, I know for sure that if I didn't have the knowledge that Joseph Smith had shared with the world and try to follow its precepts, my experience of the past 33 years would have been totally different. I would not have had the real joy of daily living that I have experienced up to this day nor the hope or confidence I have of overcoming challenges or problems in daily life. I would also not have had the understanding of the Spirit of Man and of God that I now have nor the quantum of mental, emotional and spiritual information that I have gathered to date. 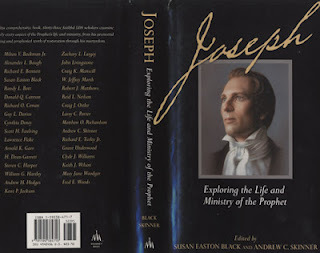 I acknowledge and affirm that Joseph Smith to me was a true and great prophet of the Lord Jesus Christ.. What are some of the things he has taught me? I will now reflect and ponder on these and write them down as I seek to be filled with the spirit of God in doing so..
Just wanted to check my sugar level reading and it looks good. Guess there are some health benefits in fasting. ..... The other place is this comfortable chair in the corner where I have access to all my computers or gadgets with links to the internet or telephone via land lines or wireless. I therefore feel connected to all my sources of information, whether on paper or on digital format. I also have experts I can call or text message to with internet conference calls, chats as well as emails to interface with. With my own mind or internal computer optimized in a spiritual mode to connect to my own spirit and that of God, I resort to organizing and typing my spiritual thoughts that flows to me during this time of fasting and prayers. When your mind begins to absorb and think about all the info, without a spiritual lead, it will soon begin to clutter as I have experienced. For a start, my optimally and personally designed apartment has an amazing capacity to store all kinds of objects, artifacts, books, diaries, letters, documents, photos etc etc that I can physically feel, touch and connect to when I want to. It becomes easier when they have been properly categorized and/or indexed to find them when I am inspired to. Next in the age of the computer and the internet, I also have an amazing technology of storing and accessing information that has been digitized which can flow to me by wire or wireless whenever I want to which is also well categorized or indexed for easy search by search engines. Last but not least I have my own brain and mind to learn of whatever I want to learn from all that is out there, with a network of neurons in my brain that scientists tell me is as many as all the stars and galaxies above us! So I have an amazing capacity for storing and thinking about all the information available to me. The fasting and prayers always helps me clear the clutter in my mind as I have a tendency to load too much into my brain! It helps me focus better and make optimal decisions that I need to have follow-up actions when I am on the go again. For now, I will just write the clear thoughts that come to me. Now to carry on from where I started from Day 1.... I picked up a book I had bought on the Prophet Joseph Smith a long time ago but have not read yet just like the many books I have purchased. It was at the time when I was in New York City and decided to make a trip to upstate New York to visit the place where Joseph and family lived known as Palmyra. It was a spiritual experience being there too as recorded in a journal post here. This comprehensive book was put together by 33 LDS scholars who examined nearly every aspect of the Prophet's life and ministry. It was not as I had expected to be one written in a style to inspire the reader as it contained most of the time much historical data in great detail, not surprisingly as it was written by scholars and not preachers. I now know in more detail the trying circumstances of the Smith family that drew them to the area of New York where Joseph eventually received his personal visitations leading to the finding of the sacred record buried by Moroni. He indeed faced a life of extreme difficulties and struggles to fulfill his destiny to translate the sacred record known today as The Book of Mormon, to organize the Church and to spread the good news that the gospel of Jesus Christ was restored to the earth. I read in detail the outward persecutions and internal struggles through which the fledgling Church was refined in Ohio, Missouri and Illinois. It led to to his martyrdom where he sealed his testimony with his blood but the Church did not end there. One need not read the book to learn of his great deeds but can view a site that tells about the life of Joseph Smith with historical site photos etc found here. For those interested in a deeper study, there is The Joseph Smith Papers Project which is an effort to gather together all extant Joseph Smith documents and to publish complete and accurate transcripts of those documents with both textual and contextual annotation. One can read an introduction about the Joseph Smith Papers here. An interesting experience when I was on my mission is that in early 1981, I had a referral from Ricky Woo, a Malaysian member who had joined the Church in Taiwan, to visit Doreen Khoo in Ipoh whom he had sent pamphlets including the Book of Mormon. When I and my companion, Elder Gary LeCheminant, visited her for the first time in Ipoh on 20th Feb of same year according to my journal, she had already read the Book of Mormon several times with her own testimony and was ready to be baptized. Doreen became the first person to be baptized in Ipoh. 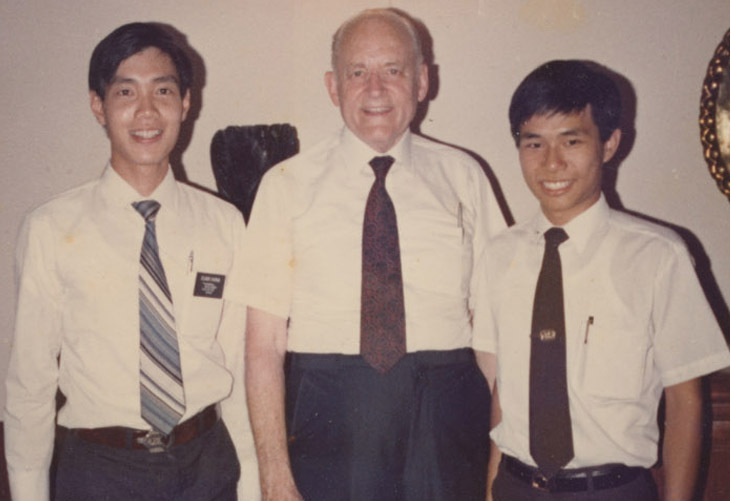 Ricky had sent a photo of President Kimball when the prophet was presiding over the Area Conference in Taipei on Oct 23, 1980. He had a remarkable story that he went up to the prophet after the conference to ask President Kimball when will the Church be in Ipoh? The prophet apparently responded with words to this effect, '..that it will be soon and the Church will grow very fast there.' President Kimball's response seemed to be prophetic as evidenced in my journal post here. 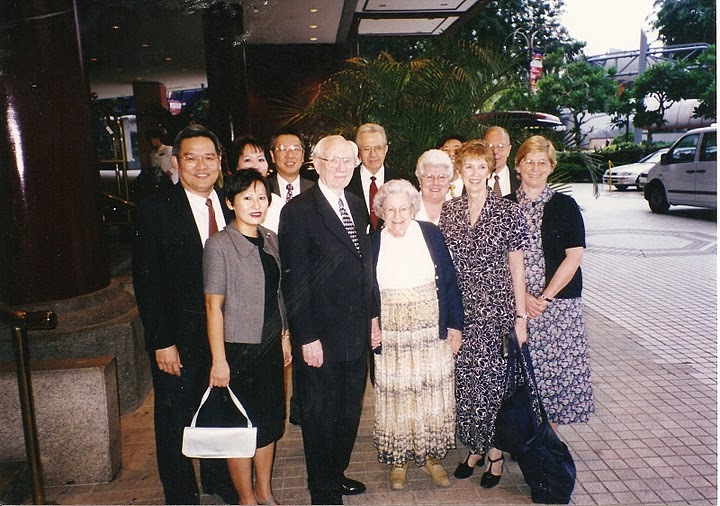 We as missionaries were shuttling between Kuala Lumpur and Ipoh which was a new city we had just started to work on. How could the prophet have known that as the conference in Taiwan was 4 months prior before our first visit to Ipoh. It was also amazing that on almost every trip that we visited Ipoh , including our first visit there, we would find success to baptize someone! In March 2000, the Prophet visited Singapore where a a special meeting was organized for the saints in Singapore. This was at the Kallang Theatre auditorium on Old Airport road. Geok Lee was invited to lead the choir and a group of us from Malaysia went down to Singapore for the opportunity to meet the prophet. At the end of the meeting, the President Hinckley took out his handkerchief from his coat and started waving at the crowd. I was standing way back in the hall and I felt a gush of something when he waved his handkerchief that caused uncontrollable tear drops from my eyes! I was overwhelmed by the experience and saw him walking down from the stage towards the exit door. Just before he left the stage, he suddenly turned to give Geok Lee a full hug. What a special surprise it was that I can vividly remember to this day. It seems like every prophet that I have some contact with directly or indirectly leaves a mark with me. The last was our current President of the Church, Thomas S. Monson who happened to be at the Marriott Hotel in Salt Lake City when I was attending a business convention there on 27 Sept 2008! He was such a humble President and Prophet was my impression as that was the closest I've ever been to one and can feel his warm spirit! 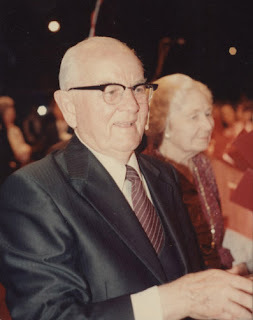 My mind reflects back to another modern day prophet I had met when I was serving as a missionary, President Howard W. Hunter who was a close friend of our mission president J Talmage Jones. President Jones served as a counselor to him when President Hunter was a stake president in the Pasadena Stake of California in the early days of their lives. Meeting this prophet technically may not be correct as at that time, he was visiting us missionaries as an apostle of the Lord only before his calling in the latter years to be a prophet! As I reflect upon Presidents of our Church from the time of Joseph Smith, my thoughts go to the Presidents of the the United States. The following is an extract of a chapter from the book written by one of the scholars, Arnold K. Garr entitled, "Joseph Smith Meets President Van Buren. 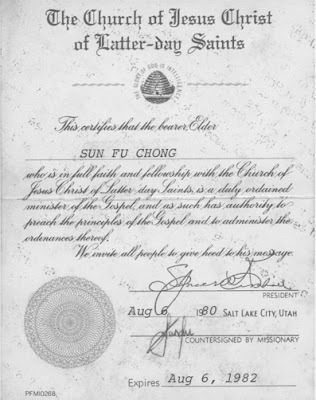 "On 23 June 2004 President George W. Bush presented the Presidential Medal of Freedom, the nation's most prestigous civil award, to Gordon B. Hinckley, president of the Church of Jesus Christ of Latter-day Saints. The official citation stated: 'As the president of the Church of Jesus Christ of Latter=day Saints, and throughout his nearly 70 years in church leadership, Gordon B. Hinckley has inspired millions.... His tireless efforts to spread the word of God and to promote good will have strengthened his faith, his community and our nation.' After the award ceremony President Hinckley met with reporters in the White House East Room. There he took the opportunity to comment on 'how much the treatment of the Church has improved' over the past 165 years. He contrasted the kindness and honor that President Bush had shown him that day in 2004 with the disrespectful way President Martin Van Buren treated Joseph Smith and his companion had visited the nation's capital 'to plead the case for our people who had been despoiled and persecuted and driven,and were turned down by President Van Buren.' The story of Joseph Smith's memorable journey to Washington, D.C. during the fall and winter of 1839-40 is an important one. The tragic event that ultimately led to Joseph's journey to the nation's capital was Missouri governor Lilburn W.Bogg's signing of the infamous extermination order on 27 October 1838. This shameful decree forced nearly the entire Mormon population to flee from that state during the winter and spring of 1838-39.'" "During the course of the interview, they discussed religion. President Van Buren asked how Mormonism differed 'from the other religions of the day.' The Prophet replied that 'we differed in mode of baptism, and the gift of the Holy Ghost by the laying on of hands. We deemed it unnecessary to make many words in preaching the Gospel to him. Suffice it to say he has got our testimony.'" My Fast is completed and I am spiritually filled! Thursday 4th Oct 2012 Mitt Romney's answer in the Presidential Debate against President Obama as to what is the role of the government in his opinion. Poll results after the end of round 1 of the Presidential debate. The final result of the US elections of 2012 is that Mitt Romney lost to Obama. Many reasons were cited for the failure of Mitt Romney to win such as his own nature of not expounding of the strength of his own character, being a private person by nature, and that there were hiccups in the last minute campaign technology his party was using etc etc. Mitt Romney much later shared his own opinion to the media. Politics in the democracy of the United States has always been very sophisticated to me starting from it's Constitution to how the Presidential Election Process works in this highly intelligent nation of scientists, politicians, and educationalists. Listen to Sam Harris who is supposed to be a neuroscientist according to Wiki but to me doesn't act like one. He claims to be a philosopher too which is apter than to be called a scientist but unfortunately the Western World with its renaissance in industrialization since the 19th century did produce a Super Power like America so he has papers to claim that he is a Scientist who shot Mitt Romney down in this media! America is always fair and whether he is a real philosopher or not received a commentary in Quora. I thank America and their Scientists and Philosophers to help me understand what Consciousness means today, which in simple language means Awareness. I used technology to improve my Consciousness to understand why a fair media person like S.E. Cupp would suggest that there is a movement or direction in the USA to make people become less Christian shared in this Video. At the yearend, what I had in the uppermost part of my mind was to focus to complete a book that I was inspired to write in dedication to my wife who passed away in 2012. I published the post below on my facebook timeline on the eve of 2019 with a New Year Greeting from me too at the Mid-Valley Mall in Kuala Lumpur. The reason is my consciousness had linked me to this amazing man, Jordan Peterson, a few months back. I had listened to many of his videos on youtube which further informed me of the subject I'm interested in which is Human Consciousness. I had to get his book on New Year's eve of 2019 in KL as a new book to read for the New Year! As Jordan Peterson is a clinical psychologist and a scientist, I knew he had good knowledge and experience to validate my own book that I've been working on for quite a while now. I had the feeling that one day I will meet him and get a personal autograph from him for his book like I did once from an International Best Selling named Cevin Ormond shared in this video. I felt impressed to add this post-development writing on this particular journal post as I felt Jordan Peterson would be a well-qualified match to counter another writer named Sam Harris, where I had mentioned in a link above and have embedded his video below, due to his condescending remarks on Mitt Romney and his religion, whom I had covered a little in this post a good 6 years ago! Video 1 & Video 2 are long debates Jordan and Sam arranged with each other. They are friendly but the language used is very intellectual with lots of philosphical or scientific terms. I am just pleased Sam Harriss who is a declared atheist with the 4 horsemen has someone popular and intelligent like Jordan Petersen to be challenged with! Interesting thing that on the first day of the year 1 Jan 2019, Jordan Peterson is already speaking aggressively on another matter in youtube which is also covered by the press.